'Nine kings in one photo'. You might have seen this photo before; I came across it a few days ago. 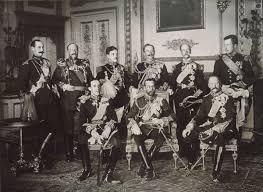 It was taken at Windsor Castle in 1910, and has monarchs from England, Germany, Greece and six other countries posing peacefully together in a bygone era. Four years later they would be plunged into the first world war (the centennial of the armistice was commemorated on Sunday), thus ending 2000 years of European absolute monarchies. While the concept of monarchy has been relegated to the history books, with most modern sovereigns serving mere figurehead roles, the concept of monarchy is very prominent in Judaism to this day - words like 'king', 'queen' and 'royalty' fill Jewish prayer and study - for it teaches us a beautiful lesson. In a world where the line between good and evil has become so blurred, it's important to clarify what good is, what evil is, and what differentiates the two: Good is something that does good, evil is something that does evil. No matter the character, explanations or facade of the doer, it's the action and the action alone that counts. Of course inner character, feelings and intent count too, but the unchallenged arbiter between good and evil is actual deeds and results. What does this means on a practical level? If we feel disheartened by our negative impulses, sense that our character is flawed, or suspect that some, or even most, of the good we do might be for ulterior motives, does that discredit or minimize our positive actions? Not at all. What makes us a good person is what we do. Not only do our inner flaws not dilute our good, they actually strengthen the good we do, because we need extra commitment to overcome those obstacles. This last idea is encapsulated in the concept of royalty. A king or queen can only be such if they have whom to rule over. Neither the crown, the robes or even the palace define a true royal. It's the people they rule (not control; control is dictatorial while true royalty must be by consent of the people) who make them king or queen. Unlike any other human trait, royalty depends on those who are ruled (you don't need anyone else to be smart, creative or strong). Just as royalty is defined by ruling over others, true good comes from ruling over our negative impulses, flawed character or ulterior motives and doing good nonetheless. So to King George, Kaiser Wilhelm and the other fine gentlemen in the photo, I'm not sure if the rest of the world finds your message very relevant, but here at Chabad you still have a place.